OnLive is set to announce a flat-rate subscription fee for older back catalogue titles and independent games on its cloud-gaming streaming service. OnLive boss Steve Perlman told Joystiq about his plans for an optional flat fee subscription model for an 'all you can eat' Netflix-style service for older games and leftfield indie titles. 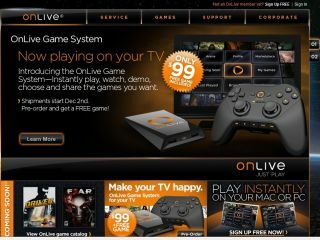 OnLive has also recently began taking US pre-orders for its MicroConsole, set to cost $99 in the US. No word as yet on plans for the UK launch. Perlman told the games site: "We couldn't be sure that [flat-rate pricing] would really work until we began to see the economics. "We just had to test people and ask what people wanted. Of all the survey questions we asked people, over 90 percent of the people surveyed were interested in a flat-rate tier. Knowing that these are older games and that newer games will continue to be a la carte." Final pricing models and game titles set to appear in the line-up are still to be confirmed. Perlman mentioned wanting to ape Netflix Instant Streaming's price range – which in the US is around $10 a month. OnLive's new MicroConsole is set to ship in the US on 2 December, with further details on plans for a UK and European launch to follow. OnLive was valued at $1.1 billion earlier this year, with BT investing heavily in the UK version of the tech, which we expect to hear more about in early 2011.